I've been trying to find another 3-HDD bay / cage for my 915R. Then I remembered that I recently took the 3-HHD bay out of my Corsair 550D. I tried that and, apart from the screw holes not lining up (easy fix), it would fit easily. Then I thought about the possiblity of putting a bigger bay in. That reminded me of the Fractal Design 5-HHD bay ... I wonder what the dimensions for that are? Google wasn't helping but it did provide this interesting support page from Fractal Design. The Define R5 has two bays, one holds 3 3.5" drives and the other holds 5. That is a total of 8 ... and they measure a touch over 280mm ... or 35mm per drive. 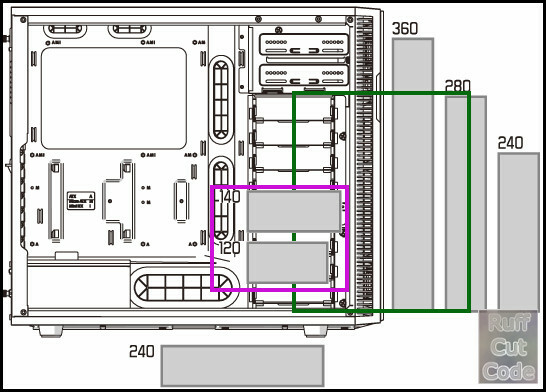 As such, the 5-HDD bay would be 175mm high. Call it 180mm. For width, its between 120mm and 140mm ... I'm not worried about the width. But will a 180mm tall bay fit in the 915R? Lucky for me, my cardboard PSU ranged from 140mm to 180mm long. Thus I have a template that I can use test my estimated height of the 5-HDD bay. No picture, but it did fit. It takes a little juggling to get it into the 915R but it fits. With 2 x 5-HDD bays in the 915R, my NAS (with no others stacked on top / bottom) will hold 10 HDDs.